The Staff module allows you to add a new member of staff or view the current staff's information using the drop down option. Clicking on the Add New button will allow you to enter details for a new member of staff. There are a number of stages to the process and once you have completed the first page, you are have the option to fill in further information by stepping through pages offered. Note: You can also search for members of staff if you have the Admin role within ScholarPack through the search box on the Home page. If you forget to enter any information the box will turn pink to remind you. As a minimum you need to populate the first five fields, down to the date of birth. The areas highlighted in red will be important for the workforce census. You can use the Staff Capture Sheet Admin > Personnel > Download Capture Sheet to collect the required information from the new member of staff. Once you have entered the information through the Staff module, you will be taken to the staff profile page where you can enter more information about any member of staff at any point. You can change any of the information on the staff profile page by clicking the cog next to the relevant section. Staff contracts are not accessible without HR role access, please see User Roles for more information. Please note: Adding a new member of staff will not automatically allocate a username and password. To allocate a username and password to a new member of staff you will need the sysadmin role. From the staff member's profile, under their name you can select Create to enter new log in credentials. This will cause a window to pop up where the administrator inputs the username and password and assigns the user a role, to allocate more than one role to a user, use the Ctrl key. When your staff members are first set up on ScholarPack we will assign each staff member a username based on their first and last initial. If there is more than one member of staff with the same initials we will use the first 2 letters from their last name. The allocation of usernames usually happens in your migration or initial training session. For consistency, we'd advise that you use the same method when assigning new users to ScholarPack. Remember to click Add to save a ScholarPack user. If you require more information please view our User Roles article. Delete: If you wish to remove them from the database. If you choose this option you will be asked a maths question to confirm this is the choice you intended. Active - No. This will not remove them to remove them from SP but in the staff drop down list, they will appear at the bottom and can be reinstated if needed. You also have the option to delete their ScholarPack account at this stage by using the tick option. Note: Items highlighted in red are important fore the workforce census. They will appear in the staff drop at the bottom in the Inactive Staff list. You may also need to remove their log on details. 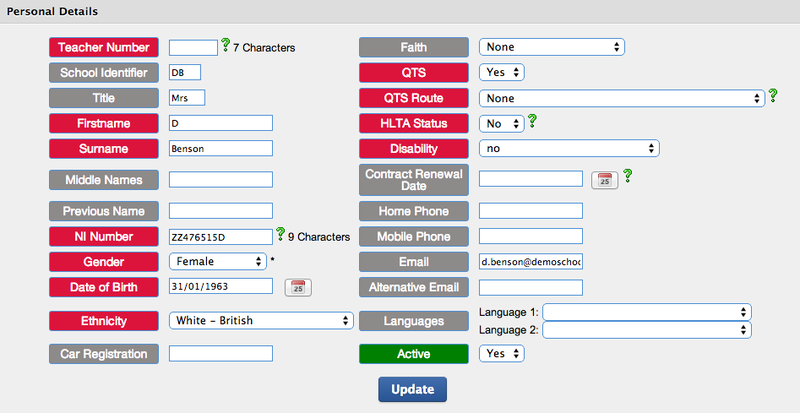 You can do this by selecting Change Passwords/Roles.